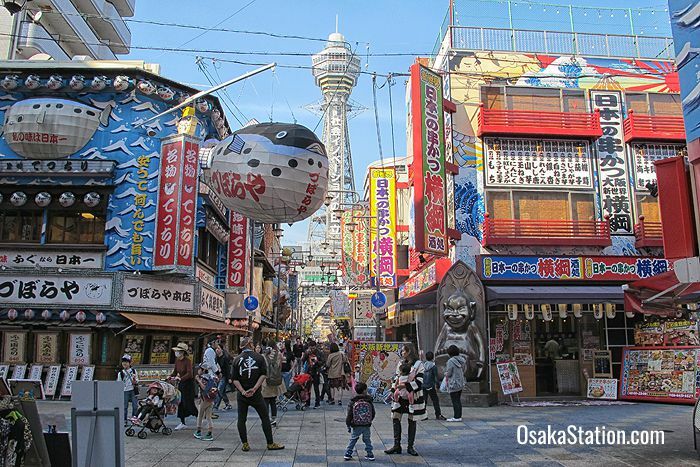 Shinsekai is a colorful area to the west of Tennoji Park packed with cheap shops and eateries and best known for its iconic Tsutenkaku Tower. Shinsekai was designed as an entertainment district in the early 20th century, and originally modelled after the cities of New York and Paris. Opened in 1912, “Shinsekai” literally means “New World” and because of its modern image the area quickly became a popular tourist attraction. At the heart of this district was the Luna Park amusement park which was modelled on the original Luna Park in New York’s Coney Island. The park, which featured mechanical rides, an amusement arcade, a music hall, and a hot spring spa, was only open for 11 years. 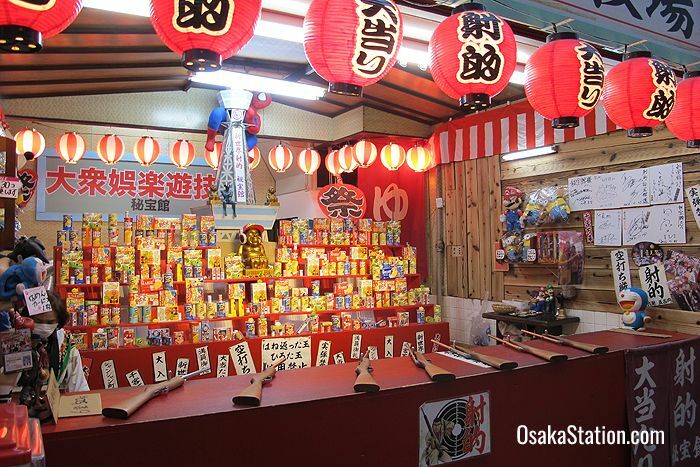 Nevertheless, these funfair origins have left a deep impression on the Shinsekai area which still has a somewhat run-down carnival atmosphere. 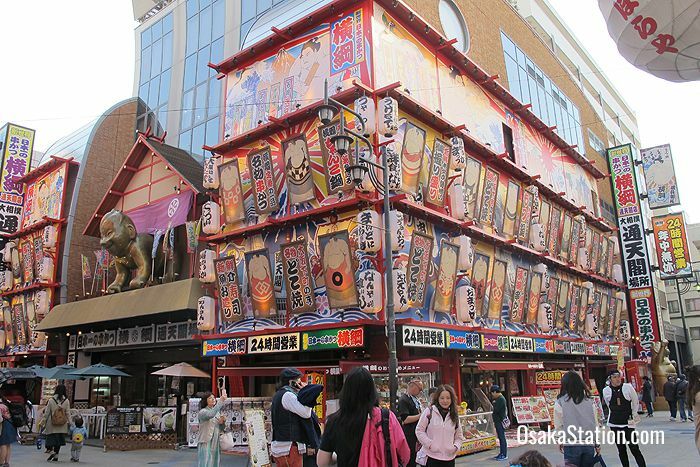 Today rickshaw runners give tours of the area, a new Spa World hot spring theme park attracts tourists to the south, and around the Tustenkaku Tower the bright and gaudy signage of countless restaurants creates a lively scene. 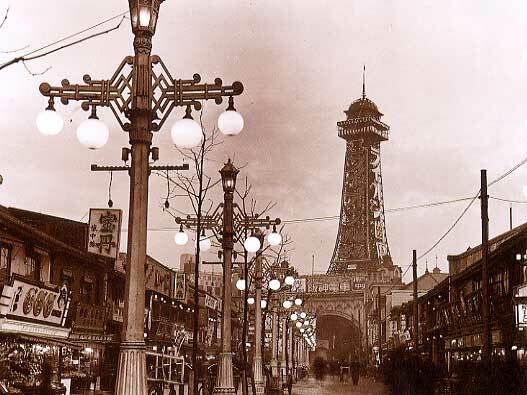 Shinsekai’s biggest attraction has always been the Tsutenkaku Tower. The original tower built in 1912 was designed to resemble the Parisian Eiffel Tower on top and the Arc de Triomphe at its base. The name “Tsutenkaku” can be translated as “Sky Route Tower” and at 64 meters high it was the 2nd biggest structure in Asia at the time. 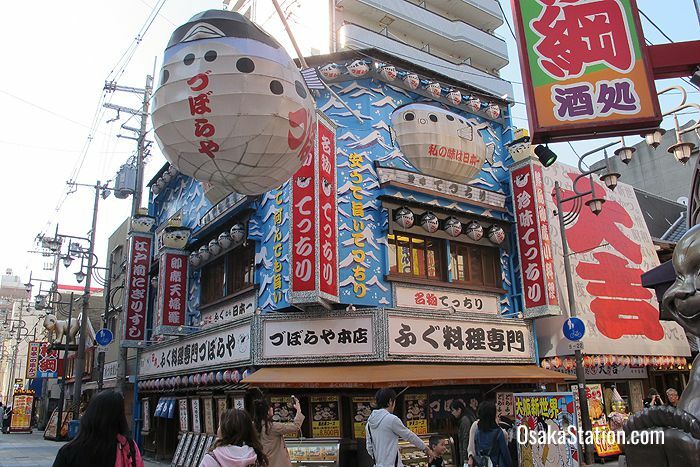 It became a symbol of pride for Osaka and people flocked to see it. 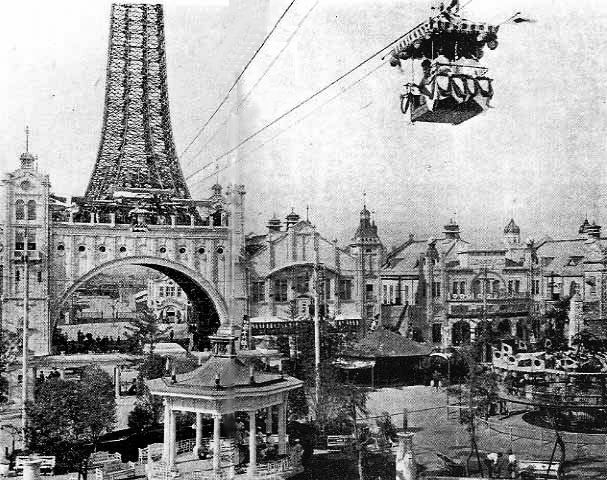 Visitors were also able to take cable-car rides on an aerial ropeway that linked the tower with the Luna Park fairground. This first tower was badly damaged by a fire in 1943, and disassembled shortly afterwards. In the post-war years however, local people campaigned for a new tower to replace it and the current tower was built in 1956. Standing at 103 meters tall it was designed by the architect Tachu Naito, who also designed Tokyo Tower. The tower today is packed with souvenir shops and amusements and has two observation decks on the 4th and 5th floors from which you can enjoy a panoramic view of the city. The fee to go to the top is 500 yen. Lines for the observation decks can be long on weekends and holidays, so the best time to visit is on a weekday. The tower also features a Kinnikuman Museum on its 2nd floor which is dedicated to a popular manga character, and on the 3rd floor there is a diorama model of the original Tsutenkaku and Luna Park. Formerly famous for its neon lighting, since 2011 the tower has been illuminated at night with LED lights which change color with the seasons. The top two bands of color on the tower are also used to give the next day’s weather forecast and the clock on the east side of the tower is said to be the biggest in Japan. For more information you can download an official Tsutenkaku PDF guide. 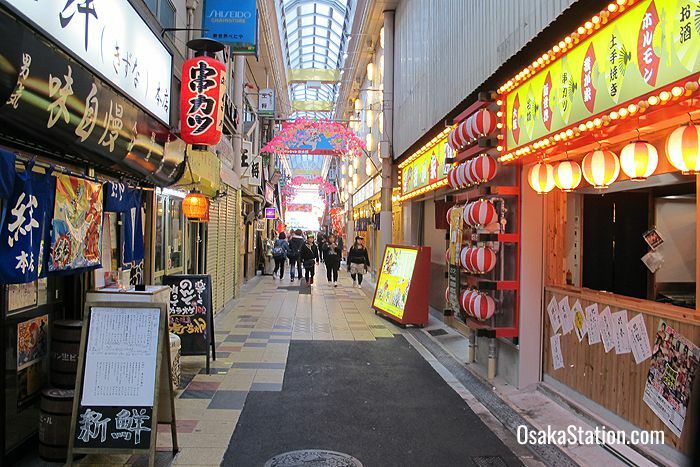 Janjan Yokocho is a covered shopping arcade that runs between Spa World in the south and the main Shinsekai area. This shopping street was named “janjan” after the sound of the shamisen, a stringed instrument that girls once played here to lure customers into bars. Today, this arcade features bargain clothing stores, pinball parlors, souvenir shops, and many, many cheap eateries. 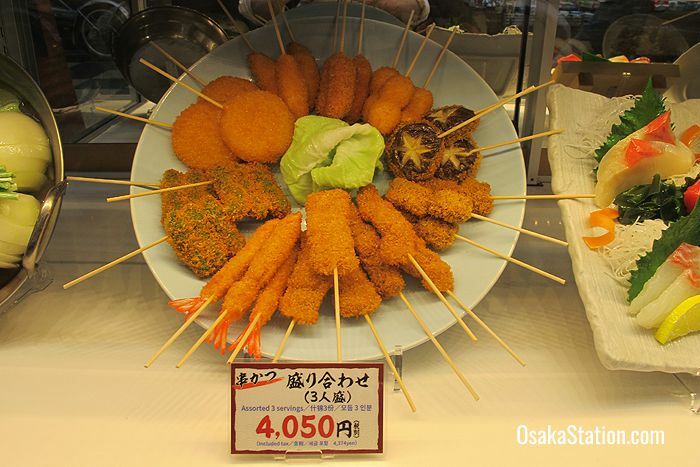 Janjan Yokocho is particularly well-known for its kushikatsu restaurants which serve deep fried skewers of breaded meat and vegetables. Washed down with a cold beer this is a particularly enjoyable way to enjoy Shinsekai culture. 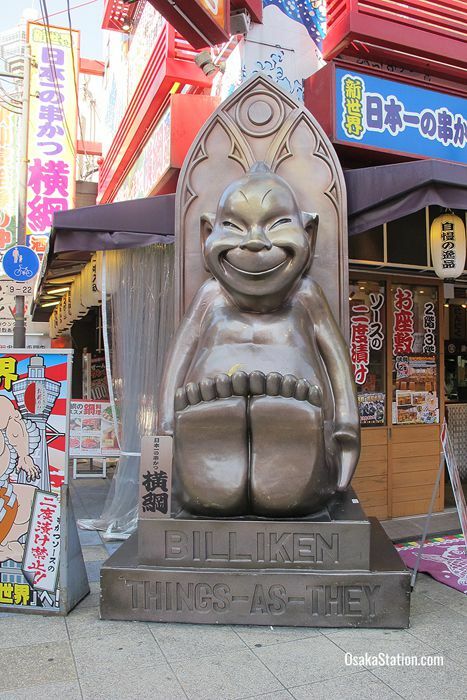 The first Japanese Billiken statue was installed in Luna Park as a decorative piece of Americana but went missing after Luna Park shut down in 1923. 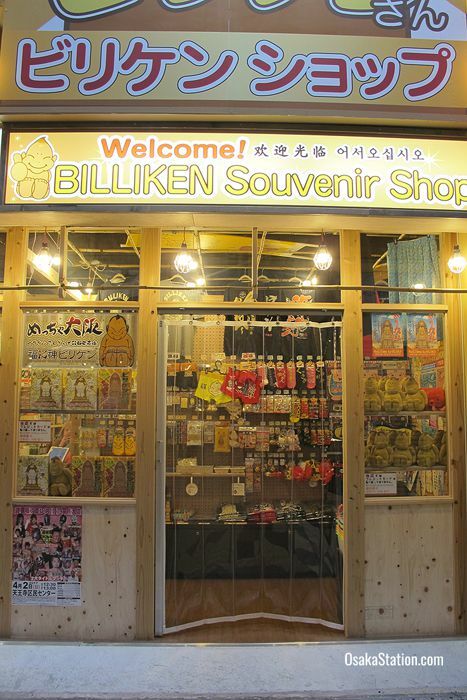 However, a new Billiken statue was enshrined in the Tsutenkaku Tower in 1979. It has become an emblem of Shinsekai, and rubbing the feet of the statue in the Tsutenkaku observation deck is said to bring good luck. Shinsekai and the Tsutenkaku Tower are located to the immediate west of Tennoji Park and Tennoji Zoo. Dobutsuen-mae Station is a 2 minute walk from Shinsekai and Shin-Imamiya Station is 4 minutes away. To read more about the local hot spring theme park see our article on Spa World.